​"Take your time with these pages. Savor them like a cup of the finest tea"
trained mind is right here, right now. 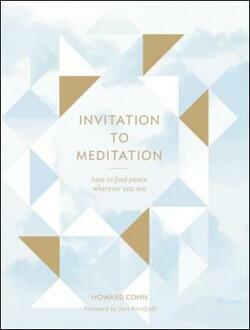 ​Meditation has gained widespread popularity as an effective tool for living peacefully and mindfully in the moment. But what is it exactly, and how does it work? Invitation to Meditation provides simple answers in a beginner-friendly format that weaves the experience of meditation directly into the reading—proving just how easy and enjoyable it can be. As accessible as it is deeply resonant, Invitation to Meditation is for fans of meditation and newcomers alike, and makes a meaningful gift for anyone interested in exploring the present moment.